Instant pot chicken recipes are can be fantastic for the warmer time of year. Spring and summer light foods without much cooking are the best. 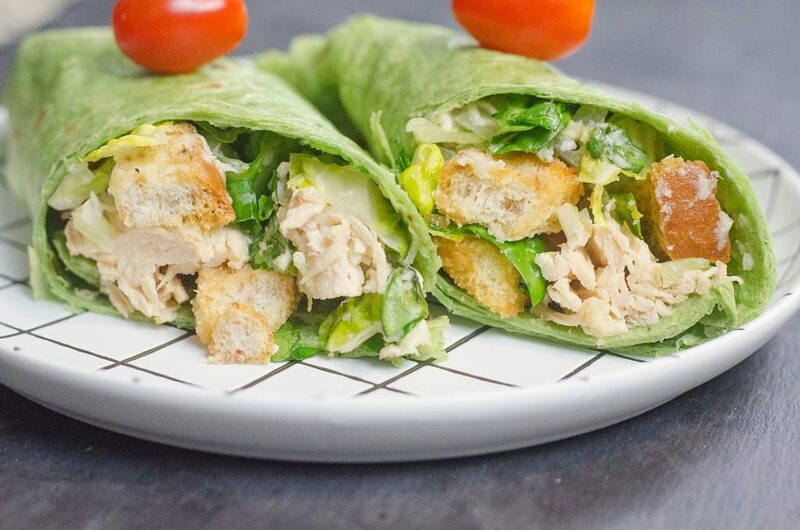 These instant pot caesar chicken wraps are light and great for warmer weather. Perfect for picnics, potlucks, or wrap trays for larger events. When the warmer season like Spring and Summer rolls around heavy meals make my stomach upset. 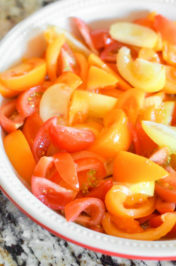 Hence, having lighter foods with fresh ingredients work magnificently. 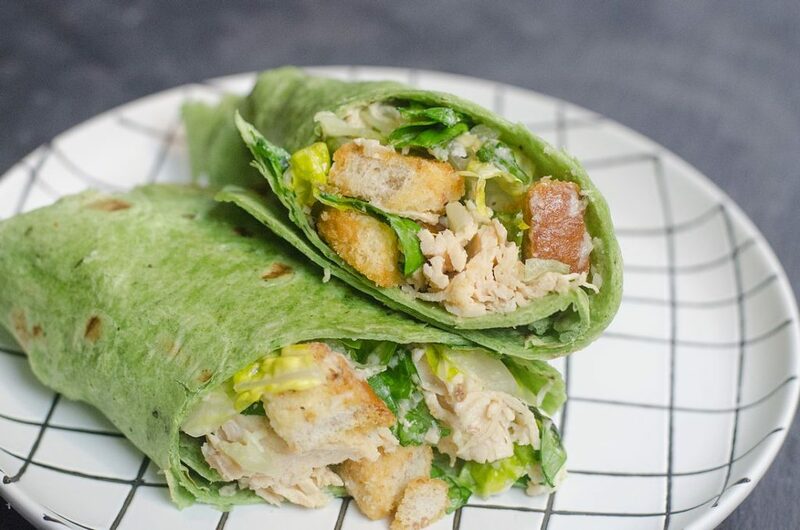 Additionally, these instant pot caesar chicken wraps work well for meal prep. The chicken in the recipe allows you to cook in a big or small batch. Make the chicken and set everything up in a meal prep. 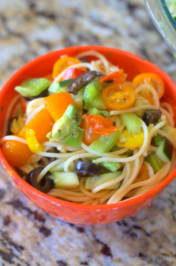 The salad can be added easily on the go. Just don’t add the wrap until ready to eat. Salad can be prepped ahead and added to mason jars which are easy to pull and eat. 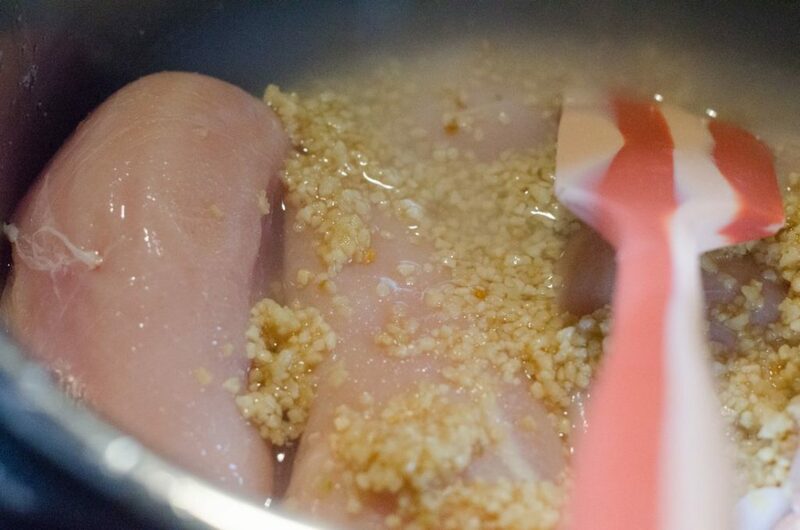 The chicken is cooking in the instant pot with garlic and lemon making it super simple for those on specific diets. As you can see there is a ton of garlic on the chicken. 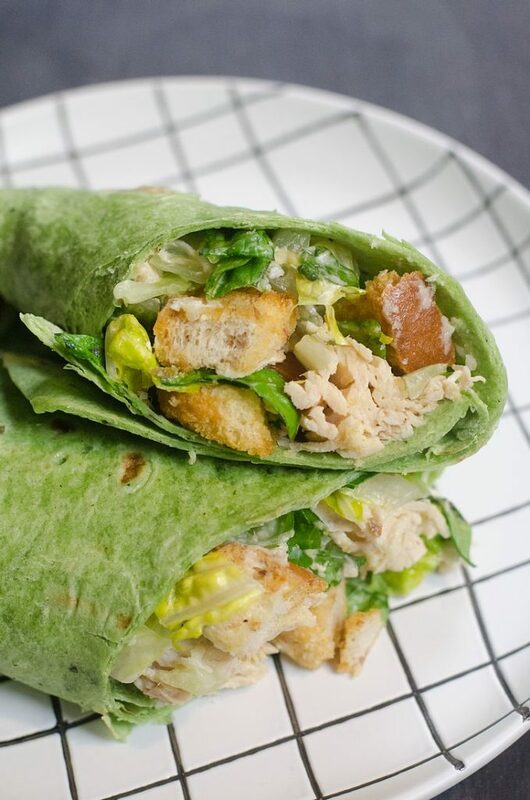 This is what really brings flavor to the chicken but still allows it to be light and airy for the caesar chicken wrap. 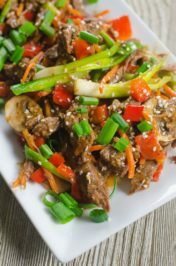 If you plan to make this dish for a party then you may want to wrap and cut in thirds or fourths. These don’t have to be cut just in half. 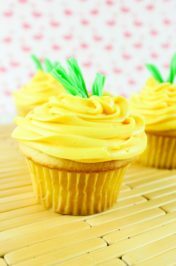 Pretty inexpensive to do a tray of these for a party or event that you might need to bring a potluck dish for. Additionally, the chicken can be left out to be made vegetarian. 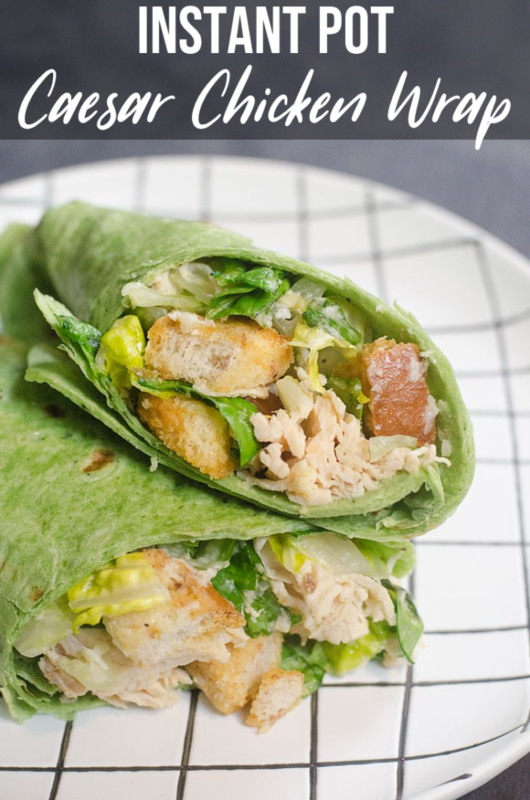 Everyone hates Monday’s so when it comes to making a dish to get over the Monday blue and not have to cook a full meal I love to make chicken wraps. Delicious, easy and not much of a clean up when done. Hence, it’s also easy to change out the dressing to whatever each person likes. 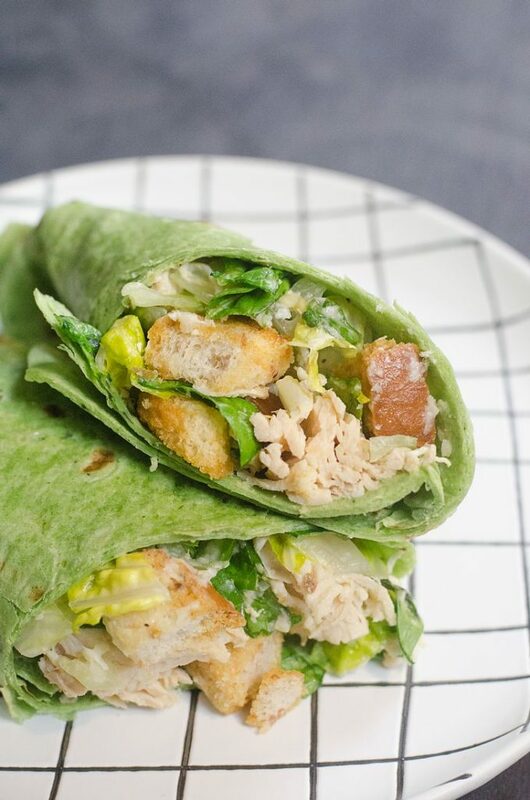 Easy instant pot caesar chicken wraps cooked in lemon and garlic. In the instant pot add the chicken and top with lemon juice and garlic. Spread the garlic around over the chicken. Add your choice of water or broth. Set to high pressure for 25 minutes. Quick release pressure when the instant pot stops counting. In a large bowl, add chopped romaine lettuce, croutons, and parmesan. Toss well. Add chopped cooked chicken and caesar dressing. Toss well. Place mixture from the bowl into the wrap and wrap up. Cut the wrap in half and serve.